Terroir: The Pascal Jolivet Pouilly Fumé comes from 20 acres in 3 separate vineyards owned by Pascal Jolivet in the villages of Tracy, Les Girarmes, and St. Andelain; and additional sourcing from Les Loges. These constitute a large diversity of glacial soils, differing from village to village. Les Loges: very calcareous. Full, firm wines. Saint Andelain: clay-siliceous and siliceous. Provide fruit, bouquet. Tracy sur Loire: sandy and limestone base. Delicacy, aromatics. 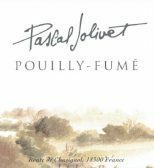 The 2018 Pascal Jolivet Pouilly Fumé is a vibrant yellow color with a dry focused nose of citrus and mineral. On the palate the wine is medium in body, incredibly precise and layered with clean, driving acidity.